Parchment scroll with the inscription "Libertad 15 de septiembre de 1821" surmounted by a Quetzal bird. Two Remington rifles crossed with bayonets and Two crossed swords, representing honour. The emblem of Guatemala was adopted in 1871. The emblem was designed by Swiss artist and engraver Johan-Baptist Frener, who lived in Guatemala from 1854 until his death in 1897. The current Guatemalan emblem was created according to the Executive Decree number 33 of 18 November 1871 (Decreto No. 33 del 18 de noviembre de 1871) issued by the president General Miguel García Granados. According to the decree, "The arms of the republic will be: a shield with two rifles and two swords crossed with a wreath of laurel on a field of light blue. 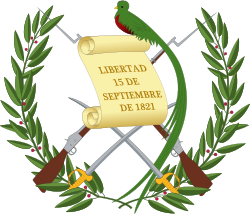 The middle will harbor a scroll of parchment with the words "Liberty 15 of September of 1821" in gold and in the upper part a Quetzal as the symbol of national independence and autonomy." The shield which is mentioned in the description above is never used and the emblem is therefore, without the shield, by heraldic standards, de facto no coat of arms. Two crossed swords, representing honor. The emblem also appears on the middle third of the flag of Guatemala. The quetzal previously appeared in the flag of Los Altos, Central America in the 1830s. ^ "Las armas de la república serán: un escudo con dos rifles y dos espadas de oro enlazadas con ramas de laurel en campo celeste claro. El centro estará cubierto con un pergamino, que contendrá la siguiente leyenda en letras de oro: Libertad 15 de septiembre de 1821, figurará en la parte superior un Quetzal, como símbolo de la independencia y autonomía de la Nación." This page was last edited on 6 February 2019, at 08:35 (UTC).